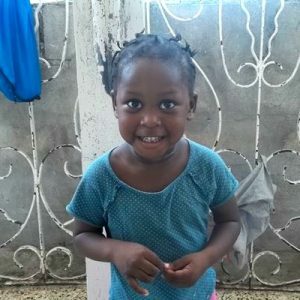 We are currently advocating for an incredible girl in our Haiti Waiting Child adoption program who recently turned 6 years old. For advocacy purposes we’re calling her “Emma,” but around her creche she’s known as “Ti Manmi” or “Little Mommy” because she loves helping out with the younger kiddos. Emma has been diagnosed with HIV, and is in need of a family who will be able to provide her with the medical treatment and love that she so deserves. She was brought to the creche when she was just one and a half years old, and has been waiting ever since. Emma’s caretakers describe her as being a sweet girl who is full of energy and who absolutely loves blowing kisses to those around her! She’s starting to grow out of nap time, so often times she will play quietly while her friends sleep. Her caretakers are so very proud of how well she’s able to listen and obey when they speak to her. Emma loves to play outside, write, and color. She is an active girl who enjoys being the center of attention. We truly think that Emma will thrive with the love and support of a family. Please Note – Much of Emma’s paperwork in Haiti has already been completed, so any family that would like to be matched with her will need to move very quickly to get their dossier submitted! If you’re interested in learning how you can be matched with Emma, contact our Haiti matching specialist at hilary@childrenofallnations.com today! HIV (Human Immunodeficiency Virus) is a virus which attacks certain cells in the immune system making it difficult for the body to fight infections. In its most advanced stages, HIV can become AIDS (acquired immunodeficiency syndrome), however, just because someone has been diagnosed with HIV does not mean that they have AIDS. With modern medicine there are certain treatments which can now help to prevent the virus from progressing. HIV is spread by coming in contact with certain bodily fluids from a person infected with HIV. In the case of many Waiting Children who have been diagnosed with HIV, the infection is transmitted from mother to child during pregnancy and childbirth. Will adopting a child with HIV put my family at risk? Many studies have shown that HIV is not spread through common household activities. For example, you cannot get HIV by sharing food or drinks, using the same bed or toilet, changing diapers, hugging, kissing, bathing or swimming with someone who has HIV. Saliva, tears, sweat, feces or urine. If you’re interested in learning more about Emma or any of the other kids in our Haiti Waiting Child adoption program, contact Children of All Nations! We have been to haiti twice and have worked in an orphanage withhiv kids. We adopted all four of our children and are interested in more info about Emma. Hi Erica, it’s great to hear that your family has such a strong connection to Haiti! I’ve passed your information along to our CAN team, and they will be in touch with you to provide you with more information on sweet Emma and our Haiti Waiting Child adoption process. Thanks! I just adored reading about little Emma. We are an adoptive family. We are getting ready to complete an adoption of a sibling set of 3 from foster care. We feel called to adopt a child/children with HIV. I am a nurse and we live near an amazing children’s hospital. We are working on expanding our home right now, but sometime in the next few years, we would love to find one or two kidddos struggling with this diagnosis to adopt. Can you speak to the HIV situation in Haiti and other countries you work with? Hi Sarah, thanks so much for reaching out! It’s wonderful to hear that you’re interested in adopting a child with HIV sometime in the near future! I’ve passed your information along to our Haiti matching specialist, Hilary, so that she can provide you with some more information on Emma and our Haiti Waiting Child adoption program. If you have any other questions, please don’t hesitate to reach out! My wife and I are very interested in possibly adopting Emma. We adopted our older 2 from domestic foster care when they were 9 and 13. They are now 13 and 17. They are awesome kids, and we would love to add a younger child to complete our family. Thanks so much for reaching out, it’s wonderful to hear that you’re interested in learning more about sweet Emma! I’ve passed your message along to our Haiti matching specialist, Hilary, and she will be reaching out to provide you with more information. In the meantime if you have any other questions, please don’t hesitate to reach out. Thanks! I see that all of these comments are from March. Is Emma still needing a permanent home? My wife and I would be interested. Hi Evan! At this time there is a family that is working towards bringing Emma home. If you’re interested in learning about some of the other kiddos in our Haiti Waiting Child program, our Haiti adoption specialist would love to speak with you! You can reach her at hilary@childrenofallnations.com. Thank you!